The Kentucky Derby offers the premier in horse racing excitement—and a chance to make a memorable, fashion statement with a signature Kentucky Derby Hat. Forget designer prices—you can make your own Kentucky Derby Hat at a fraction of the cost. What comes to mind when you think of the Kentucky Derby? Many respond the horses, others the jockeys, some say the Triple Crown—but, many say the hats. Yes, the Kentucky Derby is about the hats—at least for many in attendance. There are tons of designers ready to create your “original” Derby creation—but, you can make your own Kentucky Derby Hat with a little creativity, craft shop embellishments and less than 30 minutes of your time! Begin with an Outfit Coordinated Basic Hat. Choose a hat base that will complement your Kentucky Derby dress or outfit. Wearing pink? A fuchsia hat will not be your color coordinated KY Derby friend. Choose either a simple, basic coordinating hat—or plan ahead and choose a complementary base hat already adorned with silk, lace or embellishments that can be preserved in your final hat design. Consider Your Personal Personality in your Kentucky Derby Hat. While hat designers claim to “design with you in mind”, many are so busy during Derby season that you are run the risk of becoming a number in the sea of Hat Wearing Derby Guests. Love horses? Add a tiny stuffed pony to your hat. If birds are your thing, visit the craft shop and pick up a few faux birds to fill in to your hat. Thinking simple and sophisticated? Downplay your Derby hat with simple ribbon and lace. Planning to stand out? The bigger hat—the better. Start with a large, wide rimmed hat—and plan on adding a ton of ribbon, lace and extras to achieve your desired look! Firmly Attach Embellishments. Whether you are attaching ribbon, bows, beads—or a large peacock plume—be sure to attach firmly with a hot glue gun or take the extra time to stitch with heavy embroidery floss. Stitching makes for easier removal of embellishments after the Kentucky Derby festivities end. The girls and I have made a few Kentucky Derby inspired hats over the years--and it's especially fun for a themed party activity if you are hosting a Kentucky Derby, at-home, viewing party! 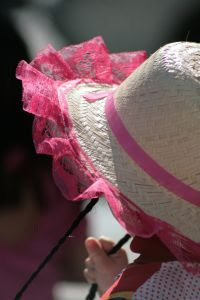 If you do not have time to make your own Kentucky Derby Hat--here are a few low cost hats that we have found for the event! This post was originally posted in 2011! We just updated it to included new recommendations and updated photographs! Note that we do include affiliate links in many of our site's posts--and may receive slight commissions from those links should you purchase through one. We only link to products that we use and recommend. Hats have sure been in the news alot of late because of The Wedding. Personally I think most of them are hideous, and then you have hat hair. Would not want to be sitting behind someone with one of those monstrous things on their head, surely you wouldn't see a thing. How fun. Um, I won't be wearing one, though. Are you in Columbus, Ohio? I'm down in Ross County and while I'm hosting the challenge from my writing blog, I'll be posting Z to A on my local blog, Ross County Roundup.